Once again I was released from the steel gates of Sheffield and able to descend the long-winding roads to Derbyshire. There I went to see the latest artist “Harp and a Monkey” to perform for a throng of rapt Derbyshire people at the “Village Folk” session in the The Lawns Hotel, Chellaston. Continuing to draw crowds and some distinctive guests (Sam Kelly and the Lost Boys next) it is an honest pleasure to have travelled to see a great venue and lovely bunch of people that are really doing things right. Furthermore, they will once again be at Derby Folk Festival this year (as will I); so if you get a chance (and can get a ticket) get yourselves down to Chellaston, site here and to the Derby Folk Festival, (see here). On this day it was “Harp and a Monkey”. Before the gig, I cannot say I had heard their musical repertoire before, the name conjures images of either the most exotic folk group or a children’s book that encourages the shyest of animals to take up an instrument (it is more the former, but someone should write the latter!) There seemed a lot of bustle before the performance; social media and conversations seemed to revolve largely in excitement around their anticipated rendition of “The Molecatcher” (Roud 1052) largely associated with Bernard Wrigley (with an awesome singular voice). On reflection, this was indeed well justified; but before we get to the heart of historic infidelity and why wronging people in dangerous professions is a bad idea for your health (and pocket), let me talk more about Harp and a Monkey. Dressed as if going to find the Mancunian equivalent of the Haggis creature they cut a rather interesting sight. Lancashire with a capital “L” they are rather good ambassadors for the county, it is pleasing to hear songs around local industry and history, and they have found an eclectic way of telling these stories. Lead singer, Martin Purdy reminds me an awful lot of Christopher Eccleston. Perhaps if he weren’t playing a tune and singing he would be method acting as the guy who is soon going to unleash all crazy hell on some poor soul. As it happens he was rather more collected and (as per his stories on previous feedback from folk veterans) he instead gave his furious intention and movements to the glockenspiel instead of a line of dialogue. He certainly gave his glockenspiel all he’s got; you don’t hear enough glockenspiel really in the general sense of music. Harp and a Monkey do present an awful lot of glockenspiel but all of it welcome and part of the overarching charm is how it’s keys allow us a glimpse into some of the different characters of songs. The last time I heard it being played with great effect was Princess Chelsea’s excellent “Lil’ Golden Book” album and that was 2011 (and it’s not strictly speaking folk), so kudos to the group for this choice. Along with the banjo, guitar and sometimes the aforementioned harp we get a wall of sound that illustrates tragedy (e.g. The Manchester Angel) or even some sweeter sounds (Flanders Shore), and this continues with their addition of electronic sampling and voice. These later inclusions permeate through several songs and give the air an otherworldly feel to the extent that when listening it sounds a bit like the veils of reality have been shaken and you are peeking into a parallel world. This other dimension would be one where mainstream folk went somewhere slightly esoteric in the 80s and never stopped for air to the present day. It is a definitely something to experience, and also something quite evocative. 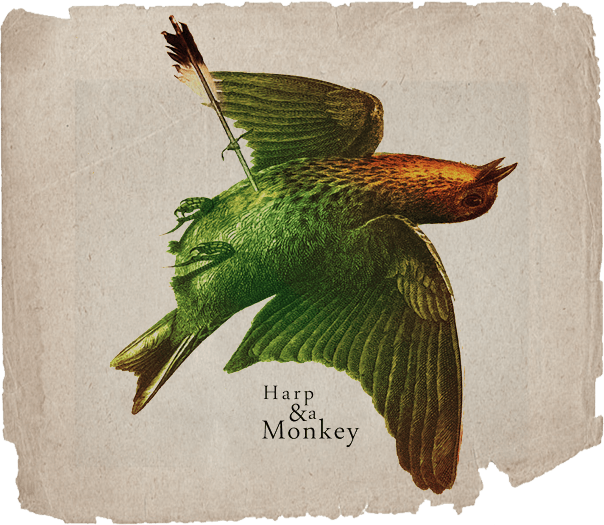 This is all great stuff, “Harp and a Monkey” use some quietly, elegant application of their instruments throughout which leads to a rather unexpected but solidly authentic capturing of the tone and subject matter of their songs. 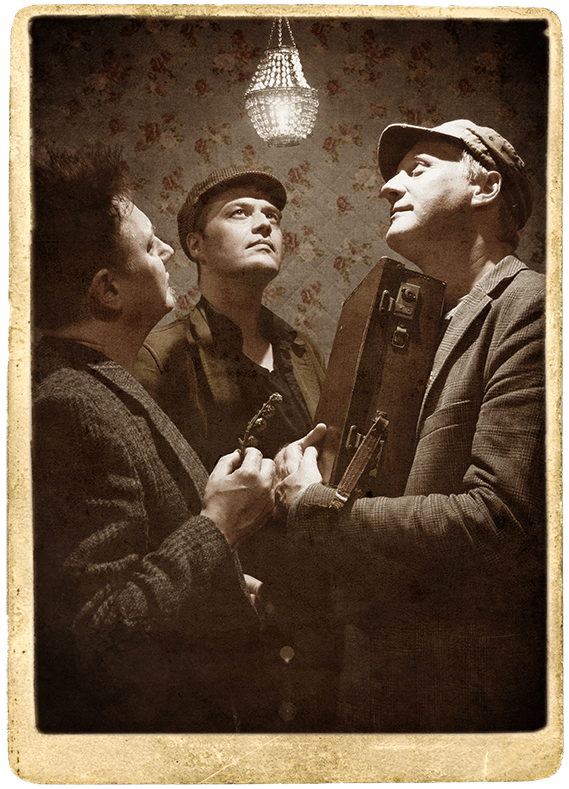 The idea of folk music that tells stories is always appealing, and “Harp and a Monkey” have a few to tell especially as their set splits across their earlier and later work, as well as songs from their work, “The War Show” taking into song some accounts of the first World War. They do cover a lot of ground be it people’s experiences in the war “The Soldier’s Song” or the heartfelt tribute of “Bowton’s Yard”, a putting to song of Samuel Laycock’s poem about his neighbours at Stalybridge, a textile town. The band’s version of this is quite homely, celebratory and proud; it has a chasing glock, and successfully paints a bird’s-eye view of ordinary people living in a street and their lives. It’s warm vocals and roots in describing community is a great addition to the set. “Pay Day” likewise touches on these themes as it exemplifies the workers laments, “oh no you’ll never know how far you’ll fall, oh you’ll never know how deeps the hole.” Some slightly understated accordion, crisp banjo and accompanying guitar build a nice, slightly jaunty track amongst a set with a reasonable amount of darker material. Speaking of the dark, “Willow and the Ghost” is a favourite of mine. A song about a ghost sighting and a tragedy is probably as folk as you can get in this musical set and in the genre fully. That being said there is something rather stripped back about it here. It isn’t the arrangement, because the glock, banjo, and guitar are quite a moving storm and when joined with some background samples you could believe that it was a folk turn for “The Human League” (going back to the earlier analogy). Instead it’s main appeal is to do with the content (though it is performed very well too). A song with melancholy, it is itself a spectre as it has the sad visage and a fatal accident within the lyrics, but unlike many songs there doesn’t seem to be a resolution; nothing is learned, someone’s life doesn’t suddenly prove worthwhile, and the skeletons of family history are not laid to rest. I quite like the fact that it is stark and simple in this regard with the lyrics, “there I saw a young girl slip into the deep” and then it turns particularly miserable, “I saw her drown, I saw the dress weigh her down.” It doesn’t let up, “Harp and a Monkey” should not stop writing these songs, that’s for certain. So as mentioned at the beginning of this page, we have to talk about “The Molecatcher.” Coming with as much menace as you like (and then some more); the band’s take on the cuckold’s reaction to a young man visiting his wife is pretty grey in morals. The harp is eerie, the whole affair sounds like it is wrapped up in a fairytale as much as history, but the type of fairytale where right and wrong has no place. After all, the Molecatcher in the story is in every sense a cuckold, he seems content with the financial recompense and blissful ignorance of what is happening despite the trap setting for the unwitting lover. An old song and one from history showing people at their most complex and morally ambiguous, the group do such a good job with their interpretation with the odd jangle here and a grim turn of voice that somehow casts judgement on the listener as if asking “what is wrong with this scene?” It will clearly ring out in times and years to come with it’s catchy, black nature,”Woe to the day, woe to the wedding vows, woe to the day”. In absolute contrast, the set finished on “Katy’s Twinkly Band.” Conceived following a comment by a young daughter at the pub that the band started playing in they have imagined an upbeat song to match what she called them (the “Twinkly Band.”) Ending on an optimistic, child-like and light note it talks of the sea, the birds and a kaleidoscope of other imagery it sets. Perhaps there is still time, perhaps it is the “Sasha Fierce” to their “Beyonce” but instead with the grittier role being the everyday, and the cheery the other face? Either way a humorous and exceedingly sparkly entry. Who will like “Harp and a Monkey”? Fans of history to be sure, my review has barely scratched their works around World War I (and there is a lot of poignancy to be had there). They are not a standard setup by any stretch of the imagination, but their songs are gloriously steeped in the family and working class to the extent that it takes centre-stage throughout. 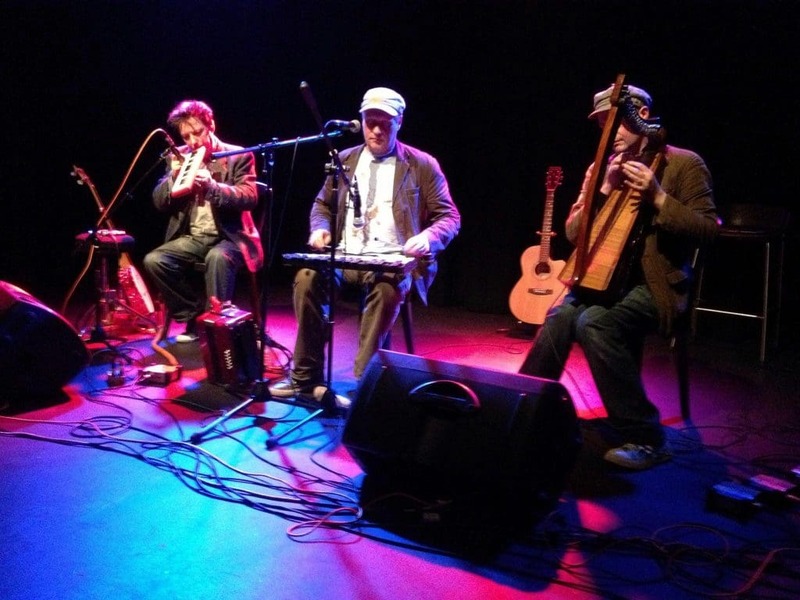 Furthermore their sound is very needed; folk with some modern influences, but ones that actually draw a lot of emotions that are often neglected in this material through the glockenspiel, harp, and banjo together. When playing the stage becomes like a kind of human echo chamber, it is how you’d imagine people’s stories travelling across space and between the stars, there is a certain beauty in the darkness and “Harp and a Monkey” has found it. 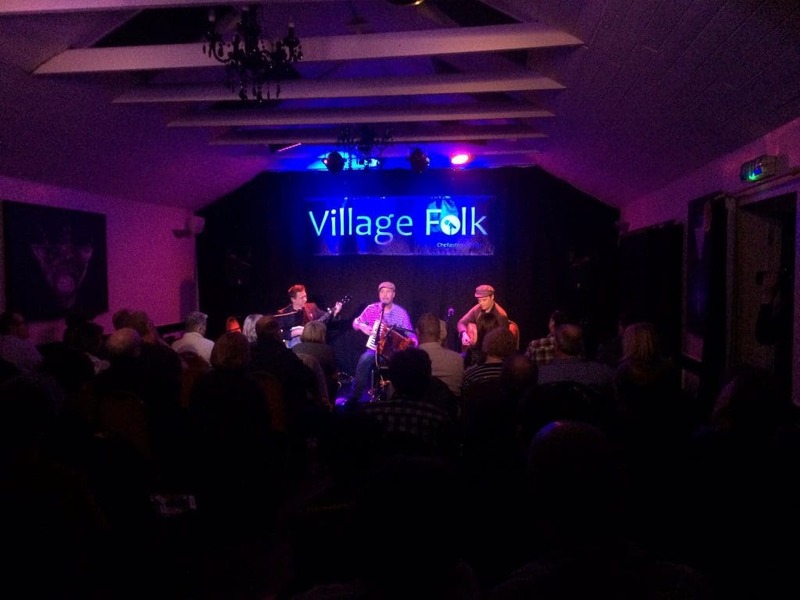 Check out their webpage here, if you are interested in upcoming Village Folk gigs, please go to the page here. See a couple of samples below (the first from the excellent Bury Met). Give them a go- they are on tour too, so check out if they are playing near you!